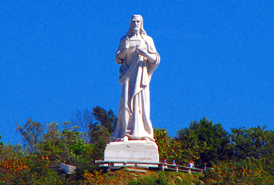 In 2012, Cuba has the attraction of forbidden fruit for the US traveler because it is just 90 miles from the US alas, as yet illegal for most Americans to visit. 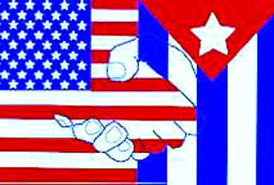 Cuban as well as US histories are entwined with many forced attempts by the US government to conquer Cuba in the nineteenth century. I was able to travel to Cuba legally because of my academic needs although, I met many who were flaunting the rules (more on that later). I booked a charter flight from Miami to Havana, the short 42 minute flight left no doubts as to how close the island is for those who may have not seen a map lately…forced to be there 4 hours prior to the flight due to government autocracy and paperwork. Luggage was weighed several times. It cost me $18 to be 9 pounds over the 44 pounds max suitcase weight. Our time in Havana was spent seeing Old Havana, the infamous Malecon and a short drive around the more modern (in Cuban terms…) Miramar District. Gorgeous facades and architecture was to be found everywhere throughout Havana but probably more concentrated in the Old Town section. Founded in 1515, Havana was the for the most part the most fortified city of the New World as well as being successfully invaded only once. The British conquered Havana In 1762, as well as holding Cuba for 11 months before then trading it back to Spain for Florida…(must have been fun back in those days…) Modern day Havana is now a city of 2.4 million and is in poor condition as well as crumbling buildings, the streets and main arteries of the City are in terrible shape. Luckily major restoration work is now in progress on junks of the city. Be sure to catch Anthony Bourdains latest “No reservations” which seem to catch lots of what I myself saw. Incredibly, when Castro senior (before his brother…) came to power on January 1, 1959, the standard of living in Cuba was the highest of any Latin American country. Now the minimum wage is $5 per month and, by the looks of the beggars and constant hassles people are in need.. As we all know, Cuba is a socialist country, there is a highest wage as well of $32 a month. Rationing of food supplies via the bodegas has been a way of live in Cuba since 1962, for food, soap, clothing, gasoline, etc. Each family gets a monthly ration book but, many Cubans companied to us that they rarely get their rations and that these are being cut more and more due to the dire economics circumstances the government is in. After the collapse of the socialist countries in 1989, Castro allowed farmers markets to exist and his brother Raul is now pushing more self employment in a make shift type of free economy where the state still controls all raw materials and supplies. The elder Castro made the US dollar legal tender in 1993 along with the Cuban peso. During our 14 days we were in Cuba, we exchanged dollars for both Cuban Pesos CUC´s and also Cuban Pesos the national money. Rather confusing but we quickly learnt that CUC´s were the sole currency in tourism locations and CUP were more for small street vendors etc. All Cubans are very eager to get US dollars. The averages Cubans saw me as if I was a millionaire because I was paying a hotel as well as food the equivalent of their average annual wage. Cubans have only recently been allowed to visit and stay at Hotels and, for the greater part of the population they are still (financially) out of bounds. Many Cubans told us that the only reason Raul Castro allowed them to stay at Hotels was so that family abroad would send more money…quite probable judging by Cuba´s economy.. 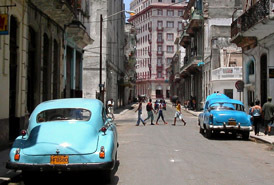 The 1950s cars running around Havana are not all they were cracked up to be and, despite being a culture shock, any Americans who think that there´s a goldmine of 50´s cars in Cuba should think again. These cars have rarely any parts remaining on their disheveled bodywork. There are many Russian cars from the 70s as well as the 80s as plus quite a number of newer more modern cars. One-horse buggies as well as the Coco Taxi (fiber glass egg transplanted on a Vespa) motorcycles with an open air plastic bubble for 2 passengers. Rickshaws are common in other cities around Cuba and we saw quite a few in Havana. Horses are also used to haul cargo around. Car traffic is minimal as well as there being no parking meters (great!!) or parking regulations to speak of. However, there is no mistaking Cuba is a poor country. This is surprising because of its mild climate, extraordinary tourist attractions, arable lands plus the major development before the Castro’s took control. One highlight in Havana was a visit to the Partagas Cigar factory where they make Habanos and Monte Cristo Cigars. At the time of the Spanish conquest, Cuba was inhabited by the Taino Indians, their word for tobacco was tobacco! The factory is located to the rear of the Capitol building and was founded in 1845. Workers were casually dressed in the factory, as well as typical; striking Cuban melodies playing loudly over loud speakers. 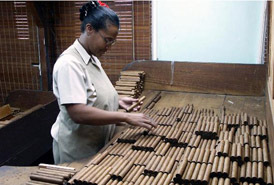 Men and women of various ages are the artisans who make the cigars. One old aged woman was constantly puffing on a huge specially made cigar. All cigars are still made by hand of course. All of the world-famous brands are created at this factory. All cigars are packed into a box and sorted to obtain a perfect color shade. A little trick I was shown…each cigar is individually turned to its best side. This factory is where they make the world’s best cigars and always have. This factory is older than the Cuban flag (1850) and has survived 3 revolutions, so far.